As much as I loved going to school in my green plaid uniform and clean white sneakers anxiously waiting to raise my hand, one of my favorite days of the year was Take Your Daughter to Work Day, when I didn’t have to sit in the classroom. I got to bop around with my dad, the car dealer, to different dealerships to sit and sometimes ride in shiny, fancy cars and meet a bunch of people who liked my dad as much as I did. As I grew, I had more responsibilities on this day; and while I didn’t accompany him every year, I learned the basics of his trade during these father-daughter business trips. Sometimes we stayed close to home, picking up or dropping off cars he had bought or purchased from other dealers but often we would venture out of the county and Dad made sure always stopped to have a sit down lunch, like grown ups. This, of course, was my favorite part of our day. On one of these trips, we found ourselves in San Francisco. 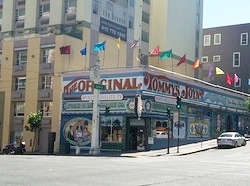 After dropping off some paperwork to one of the dealers, my dad took me to one of his favorite places, Tommy’s Joynt. The outside was painted with old-fashioned scenes in crazy colors and the row of flags on top of the building were just as colorful as my sock drawer. After marveling at the bright outsides of the restaurant on the corner, I was surprised that it was dark inside. Not only was I the only kid in the place, I was also the only girl, aside from the bartender with the dark tattoos covering her arms. Dad was comfortable there; I was curious. He walked me by the counter, so I could peer into the large glass panels and watch the hairy men in dirty white aprons quickly chopping meat onto bread or plates and passing them down the row. We found a table away from the bar and I was pointed in the direction of the overhead menu where the line formed in front of the counter. The menu was mostly giant portions of meat and I was fussy, so I ordered the one thing that I knew I could eat all of, mashed potatoes and a bottle of root beer. Dad’s voice boomed across the shadows in the room as he talked to the people around us. I drew patterns with my finger on the checkered tablecloth in the glow of the beer signs. Dad brought over a bowl of fresh pickles he fished out of a huge barrel in the corner. We talked about what we did that day for each car and why each step had to be done, to prove that I learned something on my day off of school. These professional outings with my dad are some of my favorite memories because it was just the two of us, with me acting as an adult. Now, when I have the opportunity to pass through the doors of The Original Tommy’s Joynt, an unchanged city relic since 1947, I embrace the dim lighting and masculine atmosphere. I stand in line proudly at the chop-and-serve meat counter and order something bathed in gravy to enjoy at a small table off the bar with a candle, a quick nod and smile toward the bartender as I dig in.